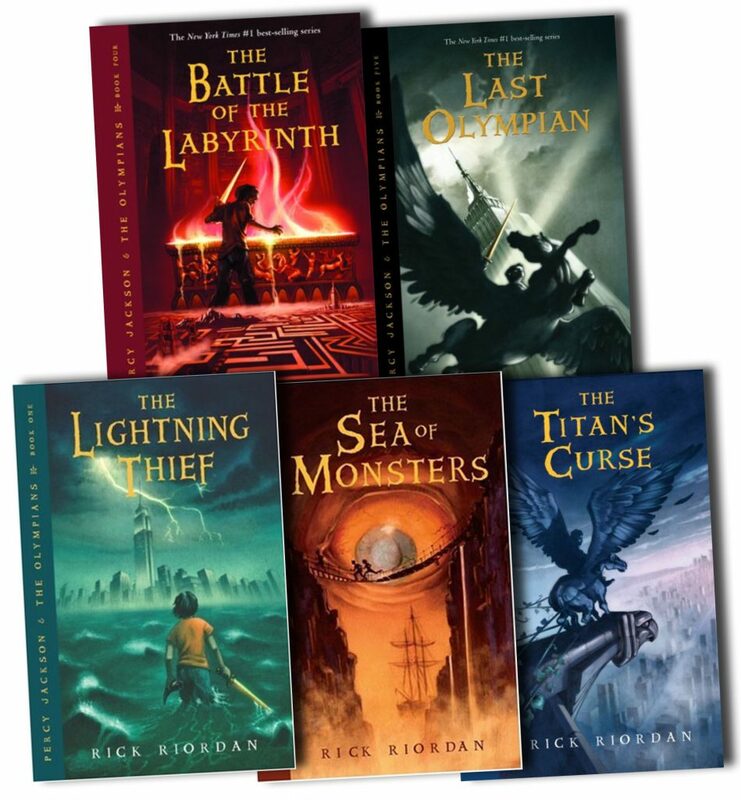 My 9 year old daughter loves the book series Percy Jackson and the Olympians. We’ve been reading it aloud together, and on her own she’s working through the Kane Chronicles by the same author. Percy Jackson, a 6th grader in the first book, finds out that he is the son of Poseidon, the God of the Sea. Percy joins other half-bloods (half mortal/half god) on many quests throughout the 5-book series in an effort to save the world from demonic forces trying to destroy it. My daughter is a fantasy book lover and avid reader so this series is right up her ally. Reading these books has inspired an interest in Greek mythology and she has done quite a bit of independent research. She also will only read books with strong female characters, and this series comes through with Percy’s two best friends Annabeth, daughter of Athena, and Thalia, daughter of Zeus. Percy’s other best friend Grover is a satyr. His body is half human on the top and half goat on the bottom. Grover has a connection with nature and is able to talk to animals. Grover is a vegetarian, which is mentioned quite often. He has a long monologue in the first book about how poorly humans have treated the earth. Through the series he is on a search for Pan, god of the Wild, who has gone into hiding because nearly all of the wild kingdoms on earth had been destroyed by mortals. Grover makes it his life mission to find Pan to help restore the earth. I highly recommend this book series to middle grade fantasy book lovers. Recommended for ages 10-14, both younger and older readers will find something to enjoy in this series. My daughter is 9 and is loving it. The books are also available as audiobooks. And sadly, the films are disappointing. Spring is here! And while getting outside is a year-round goal, warmer weather and passable hiking trails encourage even more family outdoor discoveries. The Kids’ Outdoor Adventure Book from Falcon Guides is a wonderful guide to taking full advantage of the great outdoors throughout the year. 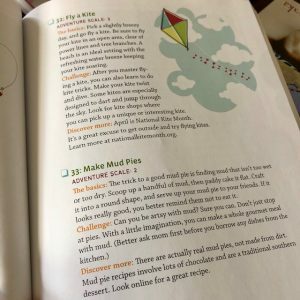 With pages focusing on destinations, foods, projects, and games, the book allows children to take the lead in family time that enjoys each of the seasons. The various activities and outdoor suggestions are age-accessible for most children. The book uses an “adventure scale” of 1 to 5 to rate the checklist items for each season. A 1 on the scale includes things like run barefoot on the beach and make a wish on a dandelion. Whereas 3s and 4s include more challenging adventures like start a compost pile, find snakes sunning, harvest pecans, and navigate with a map, and learn how to skip rocks. The top of the scale includes activities like creating a fort (snow and stick), mountain biking, riding a horse, and downhill skiing, and other activities for older kids. Each of the four seasons has its own section filled with activities that include inventive ideas as well as throwback adventures that will allow adults to reliv e childhood memories. Make pinecone feeders, anyone? Or how about grow an avocado pit? Good times! 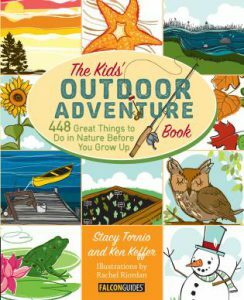 Authors Stacy Tornio and Ken Keffer have compiled a varied and interesting collection of activities and projects so every child will be sure to find many items to connect to. The simple and fun illustrations by Rachel Riordan add to the outdoorsy and natural focus. The instructions and suggestions are easy to understand, and many of them are simply enough that kids can go off and complete several checklist challenges on their own. caveat: One area of concern is that capturing various animals is included in the checklists. Catching dragonflies, crabs, and going fishing are all mentioned as “challenges.” Several challenges are about inspecting animals like lizards or fragile items like a chrysalis, and instructions about safe handling or encouraging children ONLY to observe, not to touch or move the animals, are not emphasized. One of the level 5 challenges is harvesting honey, for example, so not appropriate for vegan families. With additional resources listed in the back and a comprehensive index to help kids find their interests, this kids’ adventure guide for elementary and middle grade readers is highly recommended. 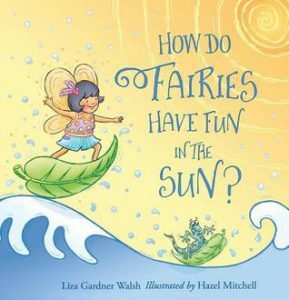 The latest in Liza Gardner Walsh’s Fairy-themed picture books is HOW DO FAIRIES HAVE FUN IN THE SUN? is a joyful romp through warm weather activities that early readers will love. Following the same rhyming question format as previous stories, the scenes are whimsical and recognizable for children. The theme of summer days and nights brings the fairies from the beach to woodland hikes to summer nights in rocking chairs. As the book draws to a close, the activities become more restful and sleepy. A connection to the world around us is a thread through the scenes, and the beautiful illustrations by Hazel Mitchell highlight sandy shores, ocean waves, sea creatures, hikes and starry skies. Children will enjoy searching for different fairies and various summer animal and insect friends that appear again and again. An appearance of children building fairy houses is featured, of course, as Liza Gardner Walsh is one of the foremost experts on fairies and their habitats. In fact, at the end of the picture book, the author has provided a six step on “How to Build a Fairy House.” This picture book is a wonderful addition to the Fairies series, and it is sure to inspire many summer activities for the families who read it together! 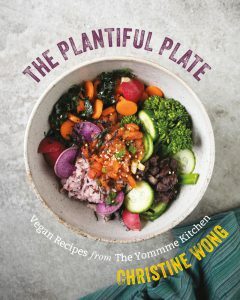 The Plantiful Plate has an inventive and adaptable approach to its vegan and gluten-free recipes. Christine Wong, who created yommme.com, includes recipes that allow cooks to choose different types of bases, proteins, spices, sauces, and so on for the various recipes. Children will love the autonomy and flexible this affords, and with no wrong choice, it will all be delicious! 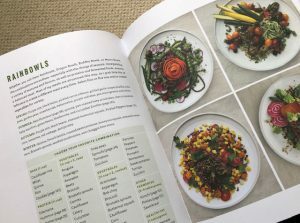 After a lively narrative in the introduction, Wong also provides an extensive list of in-season produce, methods of preparing beans, greens, and bulk items. She also discusses fermented foods, preparing a cast-iron pan, and how to store items in the refrigerator for best effect. She also focuses on going plastic-free for both environmental and immediate health effects. Older children and teens will find it both easy to read (or be read to) and informative. Recipes are arranged in sections that will make a sense based on times of day and also tastes. The START section has no-bake bars, porridge, granola, muffins, and fritters. None are overly complicated, and each has a variety of choices for flavors. The SIPS section includes teas, kombucha, smoothies, juices, milkshakes, and even a savory recipe for a vegan Bloody Mary. In SNACKS, Wong includes staples like hummus, trail mix, and veggie chips. She supplements these classics with a Brazil nut cheese recipe and onigiri. Several of these recipes utilize options from elsewhere in the book, like adding the “carrot lox” to the onigiri, or using the book’s recipe for nut flour in the cracker recipe. Again, each recipe feels accessible to all levels of kitchen ability. The SAVORY section is a treasure of salads and soups, Rainbowls for every season, noodles, tacos, dumplings, several marinades, and a gorgeous ratatouille. The recipes in this section up the ability level, but the directions are clear and still include the various options for ingredients. For cooks on the beginner scale, Wong includes simple recipes for savory staples like veggie stock, roast cauliflower, veggie fries, and stews. The chilis and masalas also feel at once “fancy” and doable. Any complete cookbook needs a solid SWEETS section, and A PLANTIFUL PLATE is no exception. From the currently ubiquitous protein and bliss balls to cookies and crumbles to ice pops and ice cream, all the usual suspects appear. There is also an amazing recipe for sticky toffee pudding and a Meyer lemon and ginger cheesecake. Something for everyone! A special mention is necessary for the photographs throughout the book. Readers will salivate over the heirloom tomato pizza, and the collection of images of ratatouilles will inspire cooks to attempt the colorful designs for the look as well as the taste. The images are truly a wonderful addition to the recipes.